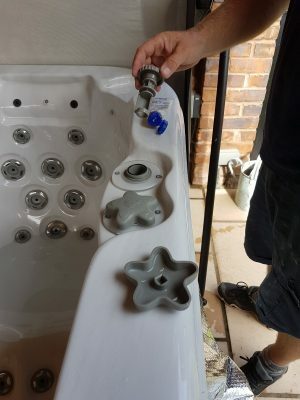 Here we have some examples of hot tub repairs and servicing in Northumberland and County Durham we have carried out. Healthy Hot Tubs provide hot tub repairs and servicing in Northumberland and County Durham. We also cover Cleveland and all surrounding areas. So if you need a repair, service or friendly local advice contact us on 03337720082 or by using our contact form. Furthermore our engineers specialise in installations. From brand new tubs for a seasoned hot tub users or a second hand tub for a new hot tub user. Healthy hot tubs help provide all our customers with the same professional expert service. So if you have just purchased a second hand tub and have no instructions, you now have a point of call. 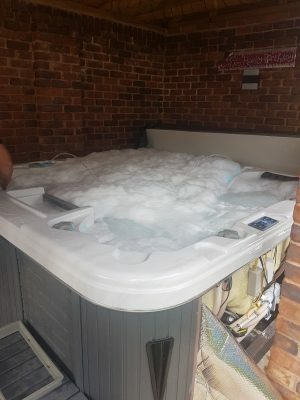 Our North East engineer was called by a lovely new customer to perform a full service on their hot tub. Firstly after arriving at the customers house our engineer adds a pipe flush to the hot tub water. This will kill anything nasty taking residence in the pipe work and give them a good clean. Remember biofilm can become resistant to sanitisers. A annual service is always recommended. After the pipe cleaner is added the water bubbles up. The bubbles help bring all the dirt out of the pipes. Importantly as well as checking for leaks, and that all major components are working, our engineer removes the filters. 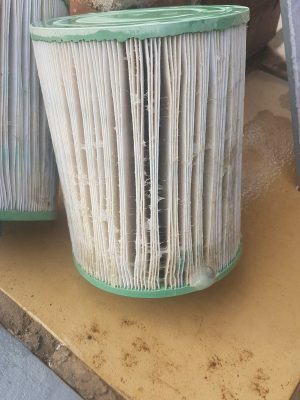 Next the filters are cleaned or replaced. Filtration of the hot tub is of up most importance to keep things running smoothly. Did you know nearly a quarter of the hot tub problems we encounter are down to dirty filters. Did you also know? In addition to removing and cleaning all jets possible, our engineers also clean and lubricate the air and water diverters to keep them turning smoothly. Finally filling the hot tub up and checking it all over again, another great job completed and happy customer. Our local northern engineer visited Sunderland to look at a hot tub leak for a new customer. 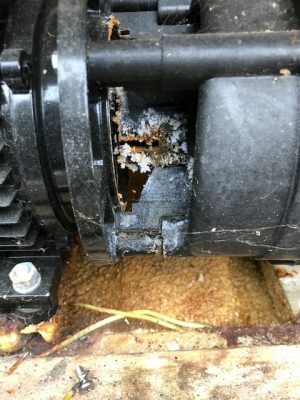 On inspection he found one of the pump seals was leaking. Our engineer fixed the leak. As in this case, unfortunately over use of chemicals can be a cause of perishing seals on pumps and unions. Luckily we are on hand to fix these for you, often we don’t have to change the whole pump. Lastly we always check the whole condition of the tub and report anything we can prevent happening in the future. Our engineer left another happy customer. 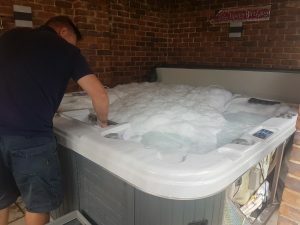 Healthy Hot Tubs cover the whole of the UK for hot tub repairs and servicing including Newcastle, Sunderland, Darlington, Stockton, South Shields, Gateshead, Hartlepool, down to cleveland with Middlesborough and Redcar to name just a few.